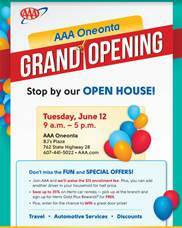 Tonight, June 4th is the Oneonta Outlaws Baseball Club’s Home Opening Game and Bassett Healthcare Night at the Ballpark! General admission is free, gates open at 5:30pmgame time 7:00pm. Oneonta, N.Y. – June 4, 2018 – After a full renovation of the recently acquired facility located at 6180 Highway Route 23 in Oneonta, Burr Truck is excited to announce that it will be hosting a grand opening event and ribbon cutting on Thursday June 14 from 12 – 2 p.m. The ribbon cutting will be conducted by Burr Truck ownership, the Delaware County Chamber of Commerce and the Otsego County Chamber of Commerce. Political, community and business leaders will be on hand for the event, which will include an honorary flag raising ceremony in celebration of Flag Day. The landmark large flag pole and American flag will be raised by a local Boy Scout troop as part of the grand opening and ribbon cutting event. A barbeque will immediately follow the ceremony which all invited guests as well as the media will attend. Burr Truck & Trailer Sales has a fifty-year history of growth and success in the Southern Tier. Founded by Charlie, Melvin and Clark Burr in 1967, Burr Truck originally operated as a dealer for Diamond Reo and Oshkosh trucks, Strick trailers and Cummins and Detroit diesel engines. Ten years later, the Burr family decided to add Volvo trucks to their inventory, which were still new to the American market. Today, Burr Truck is among the oldest family-owned Volvo Truck dealerships in the United States. While the Volvo brand is a company staple, Burr Truck also offers many other high-quality products. Burr Truck has officially opened the doors on its new 5,000 square foot facility at 6180 Highway Route 23 in Oneonta. You won’t be able to miss it – the towering and beloved American flag that’s a staple of Oneonta soars proudly over the property of the new Burr Truck location. (The massive flag waved for many years above Flagpole Nissan on the Southside of Oneonta and was planted at this address on Route 23 in 2015.) The new location is a parts shop, and will offer all makes of truck parts, hydraulic hoses and fittings, and snowplow and sander parts. This comes in addition to the company’s 20,000 square foot facility in Vestal. The company is thrilled to provide a welcomed boost to the Otsego County economy. Perhaps, the most exciting aspect of this expansion is the new local jobs it will create. Once again, Burr Truck is proving its appreciation and commitment to the community it serves by adding quality career opportunities. The company, once operated by just a handful of workers, today employs 35 people. President Chuck Burr says two of his original employees stayed with the company more than 40 years – which demonstrates that Burr Truck values and appreciates the contributions and dedication of its employees. The Burr family is excited to give back to the community that has helped them achieve long-standing success by adding more local talent to its team and providing new employees with exceptional training that will benefit both the company and its customers. Interested applicants should submit their resumes to [email protected]. To learn more about the company and career opportunities, please visit www.burrtruck.com. Chamber Friends-Don’t miss this great way to promote your business at one of our most popular events. Networking luncheons provide a great opportunity for area business people to promote their business to other professionals interested in what they have to offer or know someone who is. In a roundtable format, business representatives will have 2-4 minutes to promote their own business and distribute promotional and marketing materials. 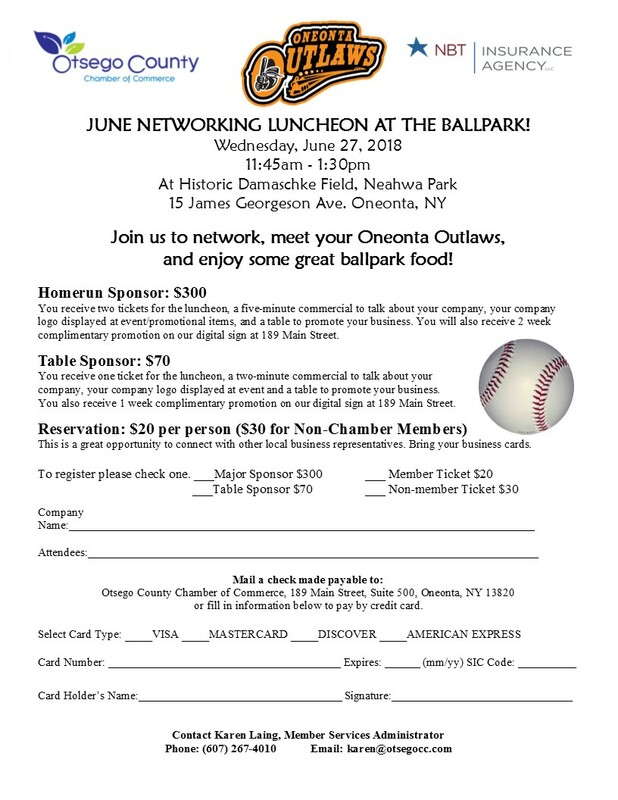 Following this structured networking, guests will be given time to network with the many other professionals in attendance and meet the Oneonta Outlaws. To make a reservation, please contact, Member Services Administrator, Karen Laing at[email protected] or call (607) 267-4010. Cost for Members is $20 and non-members is $30. Information attached. 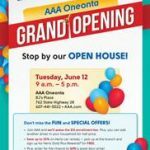 On Thursday June 7 the Greater Oneonta Historical Society will offer a tour of the Oneonta Armory, now the Asa C. Allison Jr. Municipal Building at 4 Academy. The tour, guided by Bob Brzozowski and Jim Hawver, coincides with the History Center’s current exhibition, “Oneonta’s Own: The State Militia & the National Guard in Oneonta: 1812 – 2003”. A National Guard unit was formed in Oneonta in 1875 and the first armory was built on the site in 1885. The current building dates to 1905 and has been on the State & National Registers of Historic Places since 1995. It was closed in 2003 and purchased by the city of Oneonta for one dollar. The tour begins at 7:00 PM in front of the building. The fee is $3 ($2 for veterans and GOHS members). The main floor is ADA accessible; the basement and upper floors are not. For more information, contact (607) 432-0960 or [email protected].